If you’ve been racing triathlons for a couple of seasons, you might want to upgrade your wheels. While your first pair may have helped you get your feet wet in the sport, now is the time to get more competitive this season. If you already have a decent road bike or even a triathlon bike, the next component to upgrade is your wheels. If you thought buying a bike was tough, just wait until you look into wheels. There’s a lot of different factors that make a “good” wheel and it can be hard to navigate. In this piece, I’ll provide an in-depth buyer’s guide and review the top-rated ones. The ZIPP 404 Firecrest Carbon Clincher wheelset would be categorized as a deep-rim aerodynamic wheel. Since this is a clincher, you’ll be able to easily change a flat, if you get one on the course. The inner tube is separate and makes it easy to get on and off. Compared to its earlier model, this one is built to reduce drag. Lighter Weight: Each wheel weighs about 75 grams and is lighter than its older model. New Brakes: Zipp created its ShowStopper rim braking system that has a textured braking surface that is able to face anything. Balance: Zipp created their ABLC Sawtooth technology to create a balance between being aero against high winds and staying stable on your bike. The wheelset is versatile as well; so, if you need a big range of gear or are climbing some tough hills these wheels can accommodate it. The wheels come with an XDR driver body that can “house” different cassette options. I recommend this wheelset if you want to be both aerodynamic on the course and have control of your bike. Unlike other deep-rimmed wheels, Zipp thought of how to make these wheels more controllable. They have strategically placed “dimples” on the surface of the tires. This makes helps your wheel rotation and you can stop and cover more difficult terrain easily. These “dimples” also keep water away from the brake pads you can be sure you can safely slow down or stop on a rainy race day. 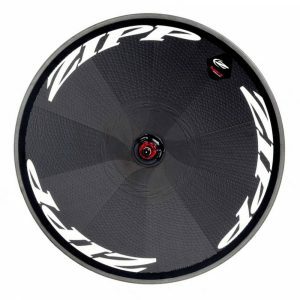 Zipp created its NSW Carbon Clincher-Advanced wheel to mimic its environment and reduce any drag and side force. Zipp studied the types of surfaces and environments to make a set of wheels that would win the “survival of the fittest” out in the wilderness you put your wheels through. The most prominent feature of this wheel is Zipp’s patented Sawtooth technology, which was developed using biomimicry. A wheelset that has a series of fin-shaped Hyperfoil (Zipp patented technology) nodes found along the rim’s inner diameter that work together with HexFin ABLC (Zipper patented technology) dimples for better airflow. The HexFin ABCL helps you handle your bike on a windy day on the road or race course. When you feel more stable on the bike, you’ll be able to focus more. The dimples found on the wheels are hexagon shaped, placed in an angular pattern so that air flow stays close to the rim and reduces drag. Compared to the Zipp 404, reviewed above, there are only slight changes for just a little more money. 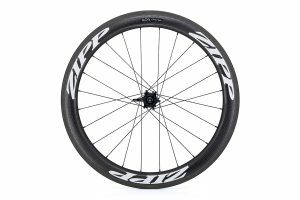 I’d recommend the Zipp 454 if you are looking for a high-quality 50mm deep wheelset. Or, if you need wheels that are easier to handle in windy conditions. Otherwise, you might be just as happy with the Zipp 404. 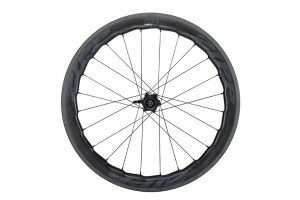 The Zipp 808 Firecrest Carbon Clincher is a redesigned 404 clincher with more emphasis on speed rather than aerodynamics. While the Zipp 808 has all the feature of its predecessors- Sawtooth, Show Stopper, and Carbon Clincher technologies- the shape of the wheel itself set it apart. The tire’s profile is quite unique itself with a 27mm width, almost straight sidewalls, and a maximum width that is closer to the spoke than the tire itself. The unique shape lends itself to being more aerodynamic and is easier to handle if you’re in crosswinds or in heading strong winds. 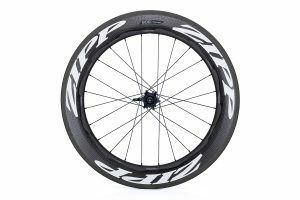 I recommend this wheelset to any triathlete who wants to take the sport more seriously than last season. These wheels are an upgrade from the 404s and the price tag matches it. You’ll be able to handle crosswinds and rain without compromising speed and stability on your bike. 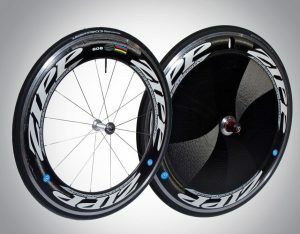 The Zipp 858 Carbon Clincher wheels are the next upgrade and the next in line from its 454 model. Off the back, the newest features are the magnetic Cognition hubs and rims ranging from 77 to 88mm depths. The wheels still have its textured rim to mimic a humpback whale like its predecessor model. You can also find the other features you’ve seen on the 454 model as well such as HexFin ABCL Dimples, Hyperfoil, Sawtooth, Showstopper, and ImPress. On to the newest feature the Axial Clutch technology, patented by Zipp. The design team decided to disconnect the ratchet whenever you’re coasting on your bike. Since the hubs have less weight, you can pedal less if you’re drafting, riding into the wind, riding in the aero tuck position, or turning corners. The Axial Clutch helps you maintain your speed through corners when you don’t need to brake, and gets you out of there faster. If you’ve been happy with your Zipp 454 wheels, then you might like the upgraded version. The Axial Clutch technology is well worth the upgrade. It really does help serious triathletes achieve more speed and makes handling the bike easier on tight corners. I’d recommend these wheels if you like the Zipp 454 and want to upgrade. The money is worth the new technology. If you’re already at least several years into the sport, I’d recommend them to you. 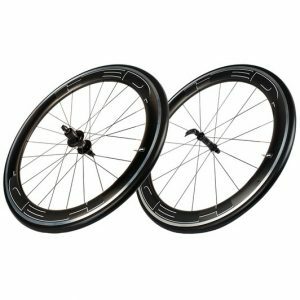 These wheels are for triathletes who have a strong grasp of the sport, comfortable on the bike, and want to drop time during the bike leg. Deep-rimmed wheels are great for flat courses, but very rarely do you find yourself with a completely flat one. In fact, you’ll have a few hills during your race or practice ride. In most cases, you’ll have switchbacks and you won’t be able to draft easily and handling your bike can become tricky. Jet engineered its wheels to take you through switchback courses. Overall, you’ll notice that the wheels are heavier than your typical climbing wheel, but for everyday hills, it’s more efficient than others. This wheelset has HED C2 rim, which has a 25mm width that creates an “aero shield” that helps reduce drag and resistance when you’re heading into winds. To make the bike easier to handle in crosswinds, Jet makes its 60mm rim depth handle like 30-40mm depth. Jet created Stability Control Technology so that it minimizes how much force side winds put on your bike. The wheels are angled at 0-15 degrees to make this happen. The wheels axels are oversized, with the front being 12mm and the back 15mm, which makes your ride smoother and reduces pedaling drag or drag from your bike mechanics. Along with the axels, the hub’s flanges are placed far apart to create a sturdy bracing angle and improved lateral stiffness. 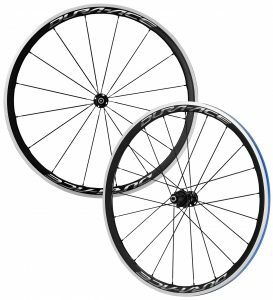 I recommend this bike wheelset if you’re relatively new to the sport and want an aero wheelset. It might be a good step up from your entry-level wheels and you won’t have to “break the bank”. Hed Jet 6 Black Review w/ WIND TUNNEL RESULTS! What makes these wheels unique is its mixing of the materials. This set is made from both carbon and aluminum, but still are stiff, sturdy, and have excellent precision on the road. The idea behind these wheels is to “balance the ticket”. The wheels have both carbon and aluminum placed opposite each other around the wheel. In effect, to balance the gasket’s weight, a material of nearly the same weight is placed on the opposite side. The hubs are made with Ultra Smooth Bearing (USB ceramic) to make the wheels smooth and reduce the amount of weight on the wheels. This helps your ride go by even faster. One of the last features worth mentioning is the Rim Full Carbon Technology that was designed with high transition grade (HTG) resin, which makes the brake’s more dependable and predictable. I’d recommend this wheelset if you’re looking for an “all-around” option. This wheel helps with nearly every aspect of biking: reducing drag and resistance, handling during high or crosswinds, and providing a smooth ride. Be warned, such a nice wheelset comes with a high price tag. However, if you’re ready to take triathlons to a more intense level, it would be a good investment. Shimano’s Dura Ace C40 wheelset is light-weight and responds well to road bumps and crosswind handling. It has a 40mm rim to help you glide while its rim width keeps you feeling stable while you speed through the course. The carbon technology is one-of-a-kind and is well-designed to give you speed and control on race day. To start, the rims are made with carbon to keep the weight low, but still are balanced, strong, and durable. The braking system is smooth to give you the most control in any weather condition so you can keep riding confidently. The carbon material is strategically layered over the ultra-thin aluminum rims to place you at crossroads between weight and rigidity. The hubs have an alloy-steel hybrid bearing cones. The cones have an aluminum body with a built-in steel ball to keep the wheel light and durable. Again, this would be a wheelset, I’d recommend if you’re looking for your first pair of new wheels. Especially, if you’re in the market for carbon wheels. There is just enough new technology to make a difference in your riding, but it won’t be a gigantic leap from your originals. The price also makes it easy on your budget if you’re still relatively new to the sport. 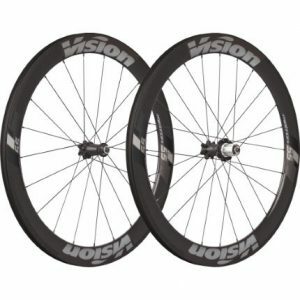 Vision’s Metron 55 SL Clincher/TLR is an aerodynamic set of racing wheels that have a reliable performance you can depend on for your upcoming triathlon season. This all-carbon wheelset has a laser-sketched micro-dot brake surface on its tires. This special technology drastically changes braking performance in the best way possible. You can be sure that this braking system is safe, reliable, and predictable no matter what weather conditions you race or train in. Sealed cartridge bearings in P.R.A hubs (6 included). If you like to ride fast or frequently race on flat courses, these wheels will definitely live up to their reputation. You’ll be flying on your new wheels and you can depend on them for a couple of seasons since they are durably built. You can take these wheels on hills, but best if they are few and far between. The only “downside” to these wheels is the weight (1750 grams), which is heavier compared to other wheels in the same price range. You’ll most likely notice their weight if you’re going slow or are climbing steep hills. Mavic created their Cosmic Pro Carbon wheels to be light-weight, fast, and have excellent braking performance in rain and shine. Like its predecessor, the wheels have an all carbon rim that can still withstand hot weather and friction created from the wheel. All which are associated with delayed braking. The braking system features SwissStop Flash Pro Yellow pads that come with the wheelset. The braking system is strong and has a consistent performance from dry to wet weather conditions. That means you can use the brakes only when it’s necessary instead of early. The rims are wide so you can handle your bike in heavy crosswinds, but they’re deep so you can still achieve high speeds. You can easily pick up speed with these wheels if you need to get out of a corner or pass another rider. I recommend these wheels if you’re in the same market as the Zipp wheels reviewed earlier. They have very similar features, but at a lower price point so you’re really getting a lot of value for your money. If money is not a barrier, these wheels are great if you need something light-weight, easy to handle in crosswinds, speedy, and have a dependable braking system. Bonus, these wheels come with inner tubes in case you get a flat. Front’s FLO 90 Carbon Clincher has two things going for it: the price and its aerodynamics. What makes the wheels so fast? 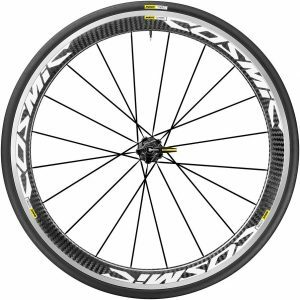 It’s the Sapim CX-Ray aero spokes, which have an aerodynamic advantage over round ones and are built to fit into lighter, stronger, and more durable wheels. The spokes can take more load reversals than any other spoke you’ll see at your next race. Flo uses its patented Vortex 2 Hubs that are made from Japanese stainless-steel bearings, which makes them last longer than more expensive brands. The hubs are easily serviced if something ever happens to them. Each wheelset comes with standard clincher rim strips, brake pads, quick-release skewers, and a cassette that can accommodate 11-speeds. The wheels can have a rim depth ranging from 56 to 65mm to reduce aerodynamic drag and increase handling in crosswinds. On the road, you can expect that the wheels are easy to handle whether you’re riding into high winds or no winds. They can predictable “behavior” whether you’re riding with a group, practicing hills, and out for a casual ride. I highly recommend these wheels, they come at a great price and deliver a top-notch performance no matter the weather condition or race you’re doing. Even if these are your first set of new wheels, just buy them. You’ll save money on upgrades if you just go with these wheels right away. The SES 7.8 Carbon Fiber Wheel Set was made for speed, which is something every triathlete wants in a race. While moving forward is important to speed, having a good braking system is just as crucial. To solve this problem for you, Enve created its molded-in, textured brake surface. This gives you more confidence to pull the brakes when you really need it. Instead, of cautiously braking every time you get nervous. The design team created the wheel around the wheel’s rim depth so that speed wouldn’t be compromised due to the wheel’s other specs. This also gives the rider a wider range of yaw angles to keep you as aerodynamic as possible. Since these wheels were made employing the Smart ENVE System it produces a strong and stable rim that is also aerodynamic. If you have the budget for these wheels, I strongly recommend them to help you achieve a speedy course for race day. These wheels aren’t just fast, they also are durable and easy to handle. Although there is an adjustment period as you get used to the 7.8 rim shape. 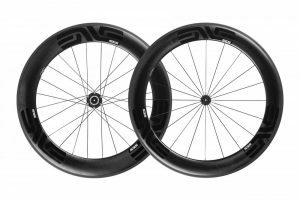 ENVE SES 7.8 Vs. Zipp 808 NSW – Which is Faster? Zipp’s Super 9 Carbon Clincher Disc created its rear wheel so that it sharpens aerodynamics, power transfer, stiffness, and durability. Compared to its predecessor, this wheel has a non-parallel brake track and a wide profile to make it one of the fastest wheels you can buy. The brake track streamlines the airflow from the tire onto the discs to reduce aerodynamic drag. While the wheels width, which is nearly the same as the width from rim to hub, gives the wheel its speed. The finishing coating on the wheel also helps moderate any spikes in heat that the brakes themselves create when stopping or slowing down. The wheel comes with Zipp’s Tangente Platinum Pro Evo Brake Pads, which have the greater surface area for the most complete brake power, enhanced clearance to work with integrated brakes, and a groove pattern to make braking easier in wet conditions. The installation process is fairly simple, after you read the instructions, and doesn’t require any tools. And, the wheel is compatible with cassettes up to 11 speeds in order to work with nearly all drive trains. Just to note, this wheel is not tubeless compatible. Since this wheel is only sold as a rear one, you have the liberty of choosing a front wheel to complement it. Zipp suggests using either is 808 or 404 Firecrest Carbon Clincher, which I reviewed earlier, as your front wheel complement. However, if you are unsure, you can always talk to your local bike store. While this wheel is not cheap if you’re looking for the best and possibly the ultimate speed-machine this wheel will do the job. I also highly recommend using this wheel if you track race during your triathlon off-season. Before I begin, I want to make it clear, the “perfect” wheel for your bike depends on what distance you race and what your triathlon goals are. Figure those two things first before reading on. It may help you narrow your focus. To answer, let’s break-down what a wheel does. A bike’s wheel affects your ride more than you think. A good “base” wheel will roll efficiently, respond well when you’re accelerating, and keep you comfortable on your bike. If you’re on a decent or high-end road bike or triathlon bike already, there aren’t many components you can upgrade without buying a new one altogether. The next and easiest component to upgrade are the wheels. It’s cheaper than buying a new bike and can actually make your current one more efficient, race faster, and possibly make you feel more comfortable in the saddle. Upgraded wheels might even take some weight off your already feather-like bike. On a more practical standpoint, most manufacturers won’t put high-end wheels on their bikes-it’s too expensive. It’s much easier and cheaper for you to buy the bike with the frame and components you want and then the wheels when you’re ready. Now, that we’ve established why upgrading wheels is a good idea, let’s talk the wheels themselves. There is a “base” wheel that needs to be established before moving to specifics. A “base” wheel used for road bikes and some triathlon bikes will have a hub and rim. A hub has the center axle and bearings, which let the wheels rotate while you pedal. The hub is connected to the rim of the wheel with spokes, which have a different number, pattern, and type depending on the wheel’s use and design. A rim is the outer part of the wheel and can be designed to hold clincher or tubular tires. I will explain these later in this section. I just wanted you to be aware of the two types. 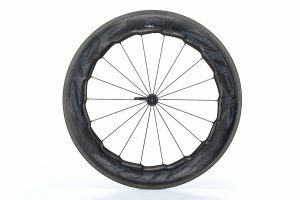 Finally, there is a market for specialty wheels that are specifically designed for tracking racing, time trialing, and triathlon. In these special events, aerodynamics and speed are in favor over comfort or handling. Typically, these types of bikes don’t use traditional spokes. Read over the parts of the wheel and how they can be designed differently. This might help you narrow down what you need for your next season. As always, this is a starting point, before going to your local bike store to ask your more in-depth questions. Road and triathlon bike wheel sizes vary, but the most common diameter is 700c for adults and 650c for smaller road bikes or “women’s” bikes. 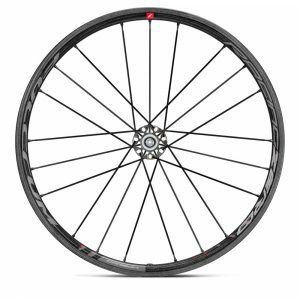 Rim diameters also vary from the standard size for commuters to very narrow for triathletes. For a standard wheel, the rims are wider compared to highly-competitive ones. For clincher tire rims, they are typically narrow so you can pump as much air into your tire as possible for more speed. Rim depth is also a factor to consider as well. A wheel manufactured with deep rims is for aero rims and wheelsets. The deep rims improve speed and stiffness but do affect handling. These types of wheels may not perform well understand extreme weather conditions. If you don’t know what exact size of a wheel rim or tire to match your current one, check the ISO/ETRO number on your wheel or ask your local bike store. As a rule of thumb, the more spokes a wheel has, the more weight the wheel has and the stronger it will be. A training wheel should be sturdy and long-lasting, but you might want a lighter option when you race. Bike brands have created different wheels that don’t need that many spokes but still provide the strength and lateral stiffness from a trainer wheel. A traditional or trainer wheel has a three-cross spoke pattern, which means each of the 24 spokes crosses each other three times. Each spoke is made of steel wire and is the same thickness for the entire length. Other wheels, typically road bikes, have radial or zero-cross spoke pattern, where each spoke goes from hub to rim without crossing a different one. Spokes, no matter what pattern, can have different thicknesses. Some spokes are the same thickness for the entire length and typically found on standard or trainer wheels. A step up from trainer wheels is butted spokes which are lighter in the middle and have more weight on the ends. Some manufacturers have different spoke designs to make their wheels different. J-spokes have a slight bend on one end to fit into the hub. Some brands think the bend makes these wheels weak and created straight-pull spokes for specially designed hubs. The hub is essentially your bike’s engine, which is made of alloy housing containing two sets of bearings which are threaded through the axle to secure the wheel to the bike. A good-quality or standard hub has bearings that seal and protect from dirt and water. Newer model hubs have cartridge bearings, where steel needles rotate in a single cartridge that can be serviced or replaced easily once it’s worn out. Very-high end hubs use better materials such as carbon fiber, super light axles, and ceramic bearings, which make the wheels lighter and the proof is in your bike performance. But, be warned those materials aren’t cheap. A traditional rim has a square or rectangle-like box section while the aero shaped rims have a triangular shaped deep section. An aero rim has a lot of advantages such as being stronger and stiffer, which affects how the rest of the wheels is made. A strong and stiff rim means fewer spokes can be used, which reduces drag and weight. Aero rims can also be made with carbon fiber which accentuates the advantages of the wheel even more. The crucial disadvantage is how the bike handles with these aero rims. It can be harder to handle and steer the bike with these types of rims. The deeper the aero-rim, the worse the effect. 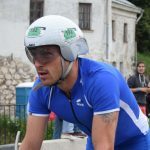 Some triathletes use different wheels depending on the weather conditions. 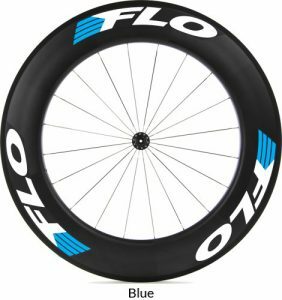 Other triathletes use wheels with aero-rims for competition only and use traditional rims for training. The final component worth noting are the types of tires available. These tires may or may not have the other features mentioned in the previous sections. It depends on the brand and model. First clincher tires are commonly used among triathletes. These types of tires hold air in separate inner tubes. This makes it easy to get the wheel off and on if you get a flat. Just take the wheel off, then the tube, put a new one on, pump air and then go. Tubular tires require more work to get them on if you get a flat. These tires do have clincher, but are stitched into an enclosed casing and is glued to the rim. This is really best used for races purposes since they are designed just for that. Now, that we’ve gone over the different wheel components, let’s take a look at the different types of wheels you can put on your bike. If you are doing a lot of competitions on hilly courses, it might be wise to invest in a pair of climbing wheels. These ones have fewer spokes and a shallower rim compared to a “basic” wheel. This means that the wheels are really light and can help you climb through the toughest courses. Typically, these weigh between 1500-1800 grams and if you’re on a budget, there are some for 1900 grams and above. No, I am not talking about training wheels you see on kid’s bikes. I’m talking about using different wheels when you’re not racing. Training wheels are heavy-set so they can withstand whatever pressure you put on them. And, are durable through different weather conditions. The best type of training wheels is made of alloy so they can last for a long time. A deep-section aerodynamic wheel has 50mm deep rim, but a mid-section one is trimmed back some while still providing the same benefits. A mid-section aerodynamic wheel usually has a 30mm rim to improve your ride quality, lower weight, and overall better bike performance against the wind. These types of wheels are usually made with carbon fiber, but you can buy ones in aluminum if you’re on a budget. If you’re a serious or regular racer, consider getting this type of wheel with a 50mm or more rim. You’ll fly through the course without experiencing a lot of drag. But since these wheels are very light, you might notice some resistance if you’re riding into some very strong wind. We haven’t completed our discussion of big components if I haven’t covered the brakes. For many years, rim brakes were the most popular type of braking system you could have. But now, disc brakes are making its way into the cycling community. Still, to this day, most bikes are made with a rim braking system. This means that when you use the brake handles, the rim is the braking surface for you. For disc brakes, the brake’s pressure is applied to a smaller rotor normally found in the center of the wheel. Disc brakes are more powerful than rim brakes, which won’t tire your hand if you’re riding for a long time or doing an Ironman. Disc brakes are also more reliable, so you can accurately put the correct amount of pressure on the disc to stop. Rim brakes, while still reliable, often have inconsistent results and you sometimes have to put more pressure on the brakes. Disc brakes are more weather resistant compared to rim ones. There won’t be a delay between when you apply the brakes and when you stop even if it’s a little wet outside. What Wheels Do I Choose? After reviewing all the information above, you might not know what wheels you need for your bike. And, I can’t answer it either because I don’t know what your goals are for cycling or triathlon races. However, based on what I’ve already told you, I can make a few general recommendations. Remember, it’s best to go to your local bike store once you’ve read through this article. It’s best to look at the “types of wheels” section to help narrow down your search. For triathlons, you’ll either use a mid or deep-section aerodynamic wheelset. The difference between the two, as mentioned above, is the rim depth. A mid-section aerodynamic wheel will have a 30mm starting depth and made of carbon. Of course, there is a cheaper option made of aluminum. These wheels prioritize lightness, ride quality and race performance against the elements. A deep-section aerodynamic wheel has a 50mm starting depth, and also made of carbon, with an aluminum option. These wheels drive through the wind without compromising ride quality and performance. But, be warned, if you’re caught in crosswinds, you might have some difficulty handling your bike. A pair of training wheels prioritizes durable over everything else. You’ll want to look for a pair of wheels made of alloy if you need different wheels when you’re not racing. If you decide to do any off-road triathlons, you’ll definitely need a different set of wheels. While road wheels are skinny and light, you need something that can withstand gravel, steep ascents and any other terrain you go over. If you plan on competing in the mountains, look for a pair of wheels with a shallow rim so you can have more control over the bike. If you’re competing on gravel, look for wheels that look big and a little over-built. These wheels will have a higher spoke count compared to your road or aerodynamic wheels. Why Do I Need to Choose the Right Set of Wheels? Selecting the right type of wheel is important so you can get the most “bang for your buck”. You also want to choose wheels based on what type of racing you’re doing and the courses you’ll most likely be racing on. For example, deep-section aerodynamic wheels are really great if you want to go fast. But, if you’re on a hilly or windy course, it might not be a great option. The wheels can start to work against you and you might have a harder time controlling your bike. If you’re ever unsure, really, it’s best to head to your bike store. Tell them what you’re training for and they’ll help you from there. I hope this buyer’s guide and product review is helpful and good luck with your season!